Synopsis: This is the story of a psycho-analyst who can solve other people’s problems but is powerless in the face of his own demons. Bored with a staple diet of well-heeled women whose husbands have stopped loving them, young boys who wet the bed and mousy typists with secret pasts, Felix Milne is forced to confront a very different problem when Adam Lucian is referred to him. Lucian is a former RAF pilot who was shot down over Burma during World War Two and then captured and tortured by the Japanese. As Lucian has already made two attempts to murder his wife, can Milne act in time to avert disaster? 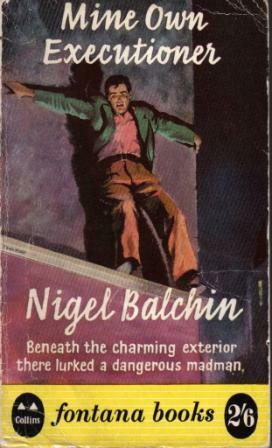 Context: No-one seems quite certain where Balchin obtained the material for this book. He said that it was based largely on his experience of psychiatry during the war. I would suggest that Balchin probably spoke to members of the Tavistock Group (The Tavistock Clinic itself may have been the model for the Norris Pile Clinic which features in the novel), with whom he would have been in touch through his work in army personnel selection. Verdict: Some may find the book a little slow at the beginning, whilst Balchin establishes his characters and situations, but the descriptions of the psycho-analyst’s routine are highly absorbing. When Lucian enters the story the book really takes off and a very high level is maintained up to and including the exciting conclusion. Availability: Second-hand copies should be fairly easy to come by.